Unfortunately, yarn doesn’t come in the “this is the absolute perfect yardage for your project” size. Making gauge swatches and measuring yardage are often reliable tools, but sometimes they just don’t cut it. There are some brave souls out there who aren’t afraid to play yarn chicken, but a great number of us (myself included) usually err on the side of caution and overbuy yarn to avoid the risk of running out. Note: For those of you who don’t know, Yarn Chicken is a term used for when you barely have enough of a certain kind of yarn to finish a project. Sometimes, when the yarn gods smile upon you, you can get lucky and finish your project with just inches to spare. And other times, you’re forced to get creative. So what do you do with these leftover, project-less yarn scraps? If you’re lucky, sometimes there’s enough left to use the leftover bits in other projects. Other times, they can seem pretty useless. I, for one, grew up loving scraps. Want some leftover fabric scraps from these scrubs that I made for myself? Yes please! Want teeny balls of random yarn that I have no need for? Why not?! Friends and family members would seek me out and give me their scraps instead of throwing them away, but were not fully able to wipe those “What the hell is she going to do with these?” looks from their faces. But – one thing scraps really make you do is get creative. Your possibilities are endless. You’re no longer constrained by whatever materials your local Michael’s has behind their big boxy doors. And maybe it’s the packrat in me, but it’s so so difficult for me to get rid of any scraps. Seriously. Those silk hangers that come in your clothes? I cut them out and wind them in my scrap ball. Leave too long of a tail when I’m changing colors? Scrap ball city. But the end result is just so freaking awesome that I have to save it all. It’s like a Pokemon equivalent of misfit yarns. Gotta catch em all! 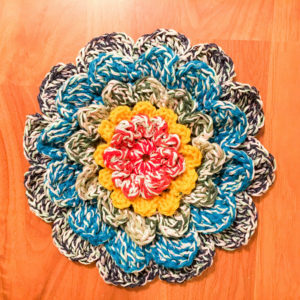 Wind your scraps into a huge ball for fun, random, and unpredictable splashes of color and texture, or save each different scrap in its own teeny ball and pick the colors and textures and your leisure. 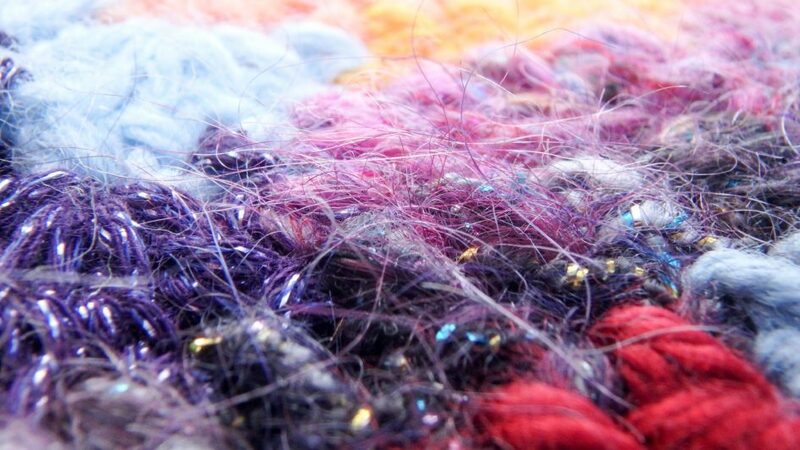 The scrap blanket will morph into a scrapbook containing strands from all your favorite projects. This Aztec Sun pattern is a favorite of mine. Tip: If the chaotic colors wig you out, tie in a color regularly to balance out and help tame the scrap’s wild ways. 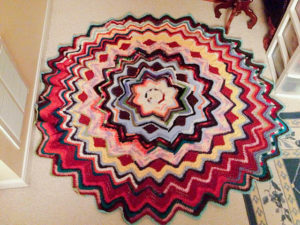 Mandalas are perfect uses for yarn scraps; make each row a different color and you’ll end up with something colorful and super unique. It probably goes without saying to use your smaller stashes for the middle rows… but I said it anyway. 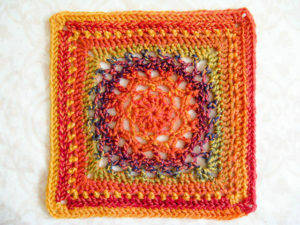 I love this Mandala pattern from Chris Simon and have made it many many times. Much like Mandalas, making each row a different color can make a beautiful product! What’s great about Rebecca Langford’s Neverending Wildflower pattern is that it’s, well, neverending. Keep it rolling or cut it off whenever you feel the need. 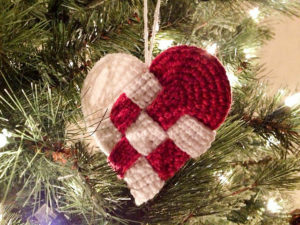 I really really love Allison Baker’s Danish Heart ornament. Seriously – I think I’ve made this pattern like 20 times, each time with different yarns and color combos. It’s so versatile that it doesn’t even have to be a Christmas ornament! Hang it from your rearview mirror (if your state’s laws allow) or stitch a ton together to make a sweet heart garland for Valentine’s day. In college, I was ambitious enough to procrastinate on my homework and attempt Phazelia’s Laptop Case. This pattern is not for those faint of heart! 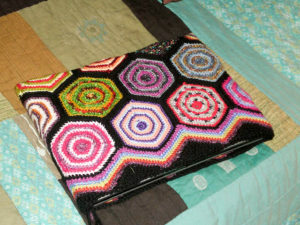 It is, however, a great way to turn your yarn scraps into a fabulous, bright, and one-of-a-kind laptop case. Especially if you have lots of finer-weighted strands, like sock yarn.